The Aries Program continues on……Until Obama's budget REQUEST….. tries to shut it down…. And that private companies would be encouraged to take up the NASA slack and produce Americans next manned low orbit vehicles…. The announcement was not well received in Congress…. In an example of what the head wants…. The body may not do…. NASA has reminded everyone that contrary to the President’s wishes….. Both Manned programs are obligated to continue on untill the new budget cuts their funding…. Of course we don’t know IF the Congress will follow the President’s direction a close the manned program down….do we? 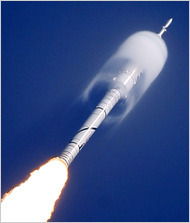 NASA managers in charge of the rocket, the Ares I, which is part of the program to send astronauts back to the moon, have put together an ambitious testing program to accelerate its development, including a flight in November 2014 with astronauts aboard. That would be four months earlier than NASA’s current schedule, which calls for the first manned flight in March 2015, and much faster than the 2017 date predicted by a blue-ribbon panel that reviewed NASA’s human spaceflight program last year. Delays and rising costs are the primary reasons the Obama administration cites for its desire to kill the moon mission and turn over to private companies the business of launching astronauts. But loud objections have come from some members of Congress, particularly those in Texas, Florida and Alabama, the homes of the NASA centers undertaking most of the development work for the moon program, known as Constellation. Last month, in a speech at the Kennedy Space Center, President Obama modified his proposal, originally unveiled in February, and called for continuing the development of the Orion crew capsule that was to ride on top of the Ares I, but only as a stripped-down lifeboat for the International Space Station. The Ares program would still be canceled. Douglas R. Cooke, NASA’s associate administrator for exploration systems, said Mr. Hanley was not subverting the White House and NASA leadership.